Inspired by Emerald Erin's Latte at Midnight blog I bought the tulle bra kit and matching bamboo fabric and latte elastic to make a set. Been busy at work so only just got around to deciding what to make. The bra pattern choice was easy. I love the Orange Lingerie Marlborough and thought the bra tulle would look good in this style. So what to make for the set? I was going to draft my own pattern along the lines of Erin's blog but then I saw on Tailormadeshop's Instagram that Evie la Luve had introduced a new pattern called the Binky. A big fan I bought both this pattern and her other new release - the Darcey soft bra. I also realised I hadn't been following her on Instagram! A quick tap of a button - I don't want to miss any more pattern releases. Initially I wasn't going to use lace as the kit didn't come with any but when I saw the Binky pattern I thought I would like to get some in there. 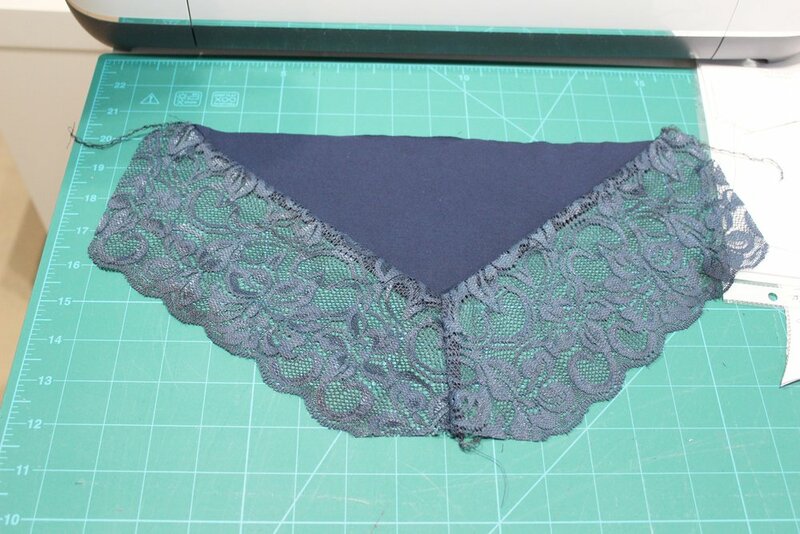 I only had scraps of lace from previous kits and even then the colour was more navy than the midnight. Rummaging around in my lace bag I came across a small piece that had come with my very first bra kit. It was a test make and I thought a waste of lace. Not enough for the lace back so thought I would try for the half lace back. 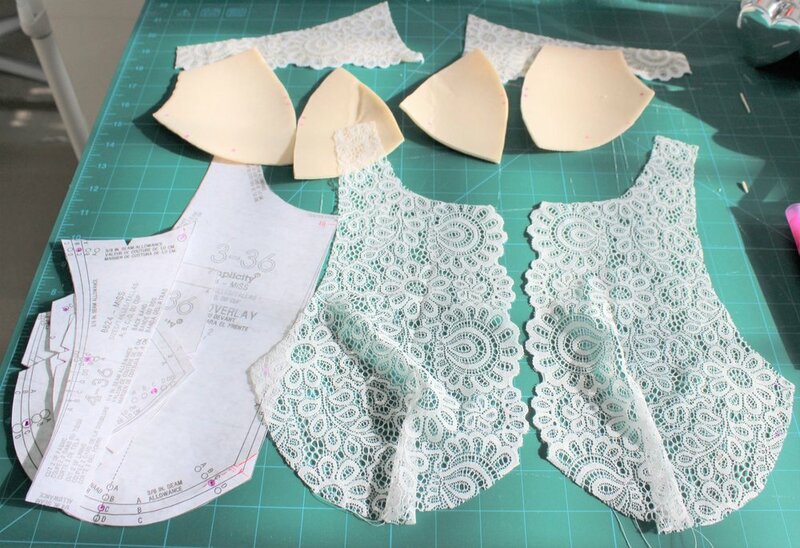 Such a tight squeeze I ended up photocopying the lace and placing the actual lace on white paper so I could see. Dark blue on green is not easy. I thought it best to get the upper cups to match. Not quite enough lace so the back isn't quite symmetrical but close enough not to be noticeable. The next big dilemma was the fold over elastic. I had only ordered plush elastic. Back to the stash. I had the perfect colour that I had got in a batch from Minerva in an attempt to always have a stock of my most used colours. Had two metres when the pattern requirements was for 3 metres. A quick check against the pattern pieces and it would be a close call! The Marlborough has been covered so often that just adding a few comments about this particular construction. 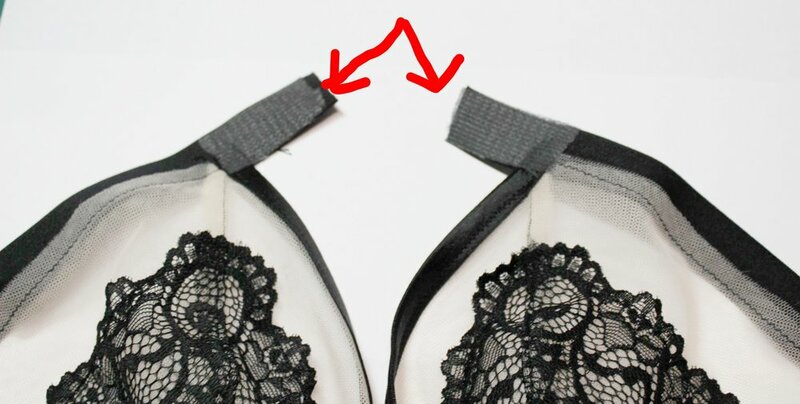 I used temporary adhesive to attach the bra tulle to the lace cup. 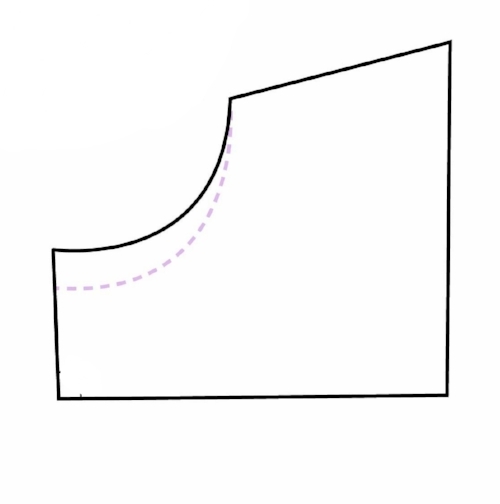 I prefer to use 1/4" clear elastic, to stabilise the upper cup just under the scallops, using a three step zigzag the width of the elastic. This seems to work better for me than normal colour matched elastic. 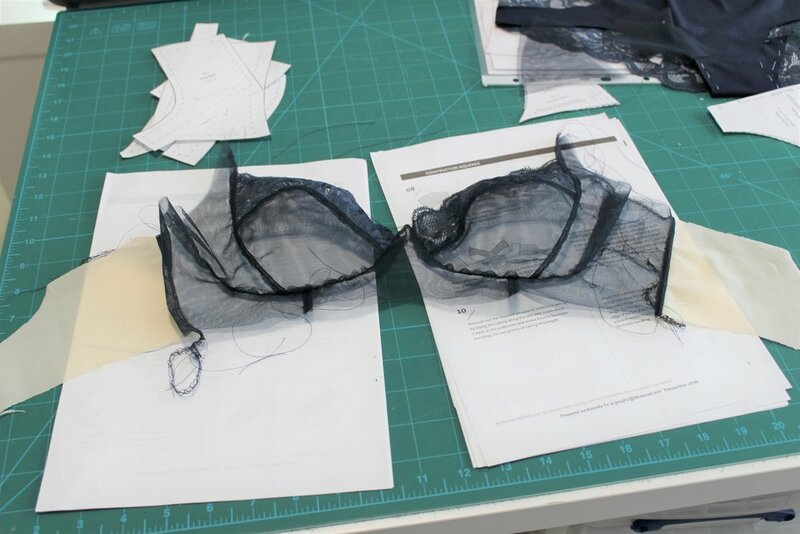 I used two layers of tulle so I could enclose the cup seams. After I topstitched in place I trimmed the seams back to the stitching so it would look neater from the right side. I normally wouldn't overlock edges but I wanted to cover the latte powernet seam allowance. After I had done all I could in the dark blue thread I moved on to the Binky as I didn't want to keep changing thread. The bamboo knit is so soft and silky but it does mean it can be very stretchy and a little awkward to work with. I always start sewing with some Stitch N Tear and go slowly using a stretch stitch and a bamboo stiletto to feed the layers evenly. I combined style 3 and 4 so had to read the instructions carefully to make sure I got in the right order! 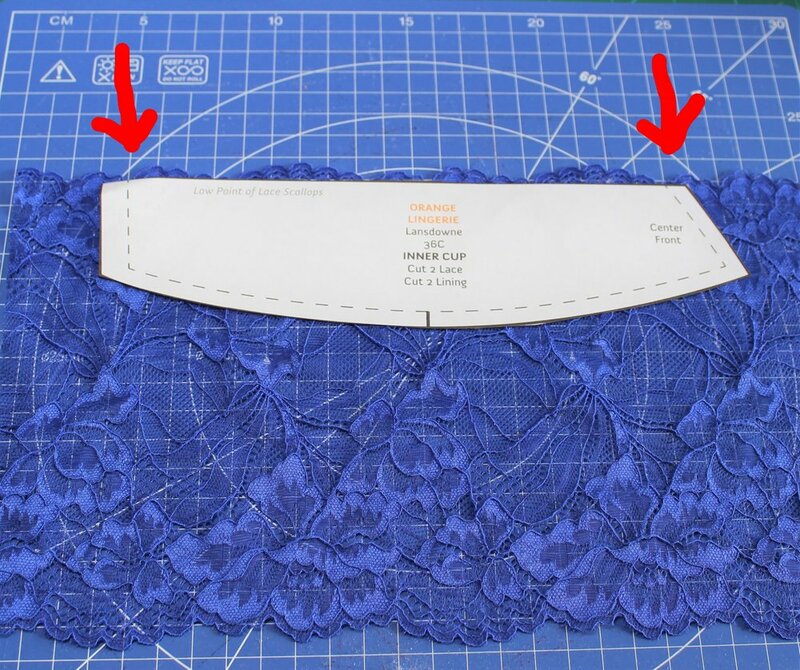 I marked out the point I had to pivot and it came out pretty good with back seam in the right place. 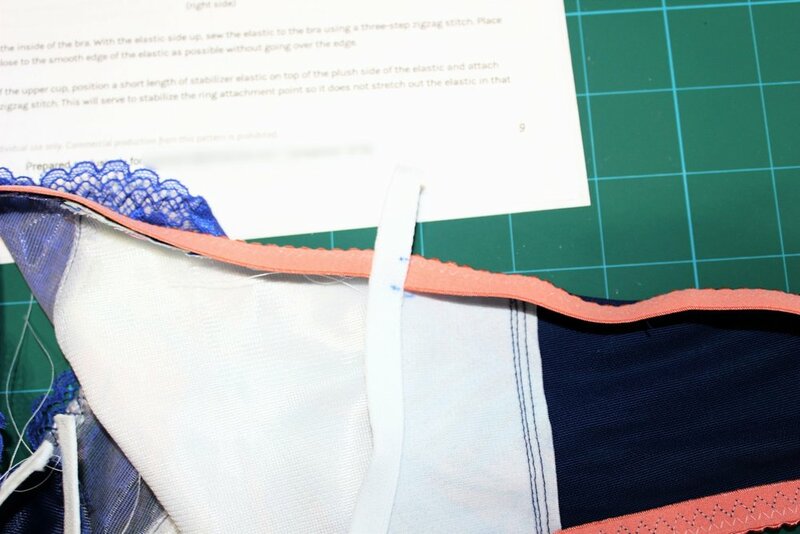 I enclosed the front between the gusset and gusset lining and then basted the gusset pieces using a silk thread which pulls out easily and without leaving a mark. On to the fold over elastic and a change of thread. I normally leave a tail of elastic at each end as I find it easy to start and stop but with such a small margin I decided not to. Makes life a little more difficult but nothing like running out of elastic. Then I applied the elastic to the front and side front pattern pieces, basted the front sides to the front before appling the elastic to leg openings. Then back to bra to use the latte thread for the straps. I always dab glue stick on both sides of strap elastic to keep it in place whilst sewing and I tend to use my walking foot. Before I attach the strap to the back I ensure that it fits neatly into the fastener. The back was a little wide so I mark where it needs to be, redraw a smooth line to blend, pin both sides together and then cut to ensure the backs match. I also use the stick glue on the inside of the fasteners. Back to blue thread for the gusset and sides and then I overlock. 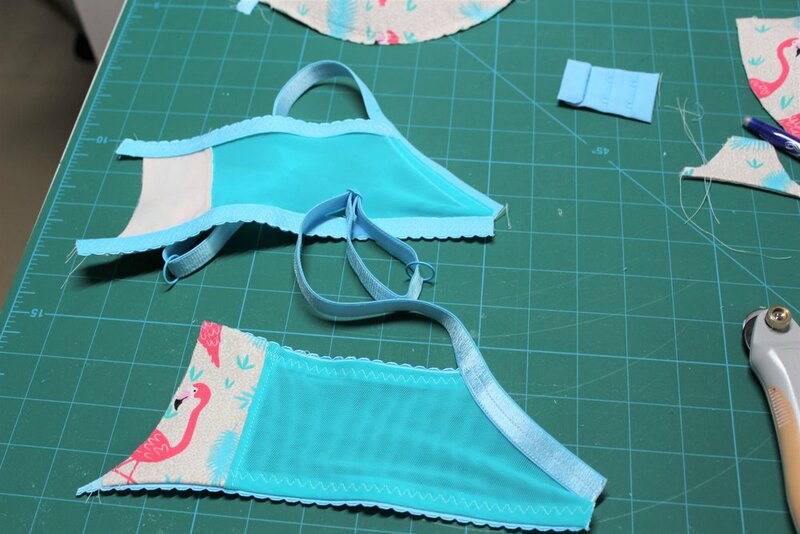 I finished the bra by attaching the ring to the front, again using the stick glue to keep in place. Just the waist elastic to do - with an 1" of elastic over. So glad I was careful. I wasn't looking forward to attaching, especially in the gap, but I took my time and it was fine. Looking gorgeous all over. I made my usual Evie la Luve size in the Binky and a perfect fit sitting exactly where they are supposed to. It goes without saying the Marlborough is a sensational fit. I never stopped being amazed at what I can produce!